Climate change forces low-lying Marshall Islands to ‘elevate islands’, Climate change has left the low-lying Marshall Islands with little choice but to consider drastic measures. https://www.sbs.com.au/news/climate-change-forces-low-lying-marshall-islands-to-elevate-islands, 24 Feb 19, The far-flung Marshall Islands needs to raise its islands if it is to avoid being drowned by rising sea levels, President Hilda Heine has warned. Plans are underway for national talks on which of the 1,156 islands, scattered over 29 coral atolls, can be elevated in a dramatic intervention to ensure safety on the islands. “Raising our islands is a daunting task but one that must be done,” Heine said in an interview with the Marshall Islands Journal published Friday. “We need the political will, and especially traditional leaders’ commitment, to see this through. A “climate crisis” policy document prepared by the office of the chief secretary painted a bleak outlook for the Pacific Ocean archipelago with a population of 55,000. 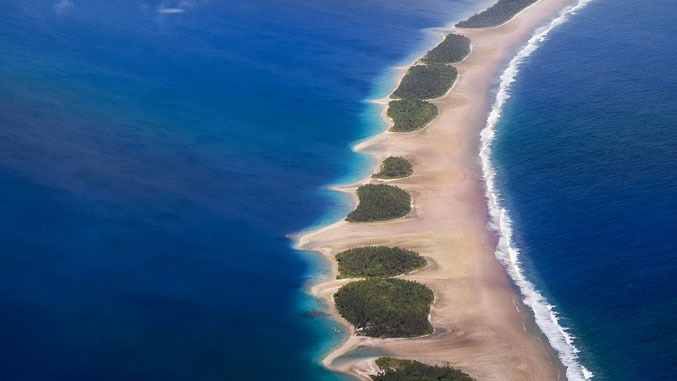 Most of the islands are less than two metres (6.5 feet) above sea level and the government believes physically raising the islands was the only way to save the Marshall Islands from extinction. They have not yet outlined specifics of how this would be achieved expect to have plans formulated by the end of the year. In the meantime, they are keeping a close watch on the ambitious City of Hope project on an artificial island in the Maldives as a viable option. To lay the foundations of the city – which is expected to accommodate 130,000 people when completed in 2023 – sand is being pumped onto reefs from surrounding atolls and it is being fortified with walls three metres above sea level, which will make it higher than the tallest natural island in the Maldives. “Whatever approach is selected, it will involve selecting islands to raise, add to, or build upon” Heine said. The Marshall Islands also aims to increase engagement with the three other all-atoll nations – Kiribati, Tuvalu and the Maldives – on climate issues. “As a group, the atoll nations need to come together to formulate their unique concerns and develop their positions and plans and identify financial needs related to climate impacts,” said Heine, who chairs the Coalition of Atoll Nations Against Climate Change. The Indy Explains: How a secret plutonium shipment exacerbated mistrust between Nevada and Department of Energy, The Nevada Independent By Daniel Rothberg 18 Feb 19, The secretive Nevada plutonium shipment that has spawned angry rhetoric from Nevada politicians has a history that starts with Russia. In 2000, the United States entered into a pact with Russia to set aside excess weapons-grade plutonium for civilian use in nuclear reactors. Congress then passed a law that it would turn the excess 34 metric tons of plutonium into MOX, or mix-oxide fuel, at a newly built facility in South Carolina. But that statute came with a firm deadline: If the MOX facility was not operational by 2014, the Department of Energy would be required to move one metric ton of plutonium stored at South Carolina’s Savannah River Site, a nuclear facility built in the 1950s, within two years. After years of cost overruns and technical challenges, the Trump administration scrapped the facility. Meanwhile, the state of South Carolina obtained a court order in 2017 requiring the Department of Energy enforce the deadline and move the metric ton of plutonium by 2020. Less than one year later, the agency said it moved a half-ton of that plutonium to the Nevada National Security Site. The action came after months of questioning from state officials, and its furtive nature has spurred a lawsuit, driving a deep chasm between the state and the agency. Four months after South Carolina obtained the court order, Nevada officials heard that the federal government might be sending some of the plutonium to the state, according to court records. From August to November, state officials began asking questions about the potential shipment. But Nevada officials received few assurances from Department of Energy officials. Beyond a general ‘expectation’ that any plutonium would be removed by approximately 2026-27, [a November 20] letter did not contain any of the requested assurances,” Pam Robinson, the policy director for then-Gov. Brian Sandoval, wrote in a December affidavit. What Nevada officials didn’t know: the United States had already moved the plutonium. That surprising disclosure came months later — on January 30 — when a general counsel for the National Nuclear Security Administration (NNSA) disclosed that the agency had made a half-ton plutonium shipment from South Carolina to the Nevada Test Site prior to November. Members of the state’s congressional delegation also released fiery responses. State officials worry that the plutonium shipment to the testing facility, which is about 65 miles outside of Las Vegas and occupies an area the size of Rhode Island, could set a precedent for the federal government to send more nuclear materials to the state. In court filings, lawyers for Attorney General Aaron Fordalso argued the federal government failed to fully inventory the environmental impacts of the size and type of plutonium being sent to the highly guarded site. They also view the action as a backdoor move to open Yucca Mountain, the controversial nuclear waste repository that sits in the remote desert about 100 miles outside of Las Vegas. George H.W. Bush: Dirty Tricks and Regime Change in Nuclear-Free Palau, LA Progressive 29 Dec 18 Amidst all the presidential pomp, on Dec. 5 George H.W. Bush’s casket was lifted off the black-shrouded bier that had carried Abraham Lincoln after the 16th president’s assassination and driven from the U.S. Capitol to the Washington National Cathedral. But as far as I’m concerned George H.W. Bush went from lying for the state to lying in state. ………..
As former CIA chief, Bush headed what LBJ called “Murder, Inc.,” and, as mobsters say: “The fish stinks from the head down.” The Pentagon had motive: relocating bases from the Philippines (closed after Marcos’ overthrow) to Palau – but the world’s first nuclear free constitution thwarted this aspiration. To find out who commits a crime, see who benefits from it: The IPSECO debt and political violence finally wore Palauans down; in the 1990s their antinuclear framed rules lost at the polls. Palau was, in effect, annexed by Uncle Sam, as was the rest of Micronesia – which, as Bush knew from his WWII days, had vital strategic value. ………. The United States and other high carbon dioxide-emitting developed countries are deliberately frustrating the UN climate summit in Katowice, Poland, Vanuatu’s foreign minister has said. His warning came as Pacific and Indian ocean states warned they faced annihilation if a global climate “rule book” could not brokered.In a bruising speech before ministers and heads of state, Vanuatu’s foreign minister, Ralph Regenvanu, singled out the US as he excoriated major CO2-emitting developed countries for deliberately hindering negotiations. Regenvanu said the countries most responsible for climate change were now frustrating efforts to counter it. The UN’s climate change talks in Poland have been distracted by a semantic debate over whether the conference should “welcome” or “note” the IPCC’s special report warning of dire consequences if global warming rises more than 1.5C above pre-industrial levels, with a bloc of four oil-producing countries – the US, Saudi Arabia, Russia, and Kuwait – insisting the report be only “noted”. Documents from the conference presidency, seen by the Guardian, indicate the issue of how to acknowledge the report will be returned to later in the week and is likely to further slow progress on negotiating a final outcome. Negotiators said they are growing increasingly pessimistic that talks can be concluded by their deadline on Friday……. As 193 countries at the climate talks seek to establish a “rule book” on how to implement the commitments made in the Paris agreement three years ago, Regenvanu condemned a two-tier system that exempted high-emissions countries from reductions obligations, saying the world needed “one common rule book, in which rules apply to all”. French Polynesian president acknowledges nuclear test lies https://www.princegeorgecitizen.com/french-polynesian-president-acknowledges-nuclear-test-lies-1.23500250, Thomas Adamson / The Associated Press, NOVEMBER 16, 2018 PARIS —French Polynesian President Edouard Fritch has said the leaders of the French collectivity of islands in the South Pacific lied to the population for three decades over the dangers of nuclear testing. From 1960 to 1996, France carried out 193 nuclear tests in French Polynesia. The images, such as a mushroom cloud over the Mururoa atoll, provoked international protests. “I’m not surprised that I’ve been called a liar for 30 years. We lied to this population that the tests were clean. We lied,” Fritch told officials in the local assembly Thursday in footage broadcast by Tahiti Nui Television. France’s overseas ministry declined to comment when contacted by the AP Friday. Bowing to decades of pressure, in 2010 the French government offered millions of euros in compensation for the government’s 201 nuclear tests in the South Pacific and Algeria. But the process is painstaking and many have still not received compensation. Bruno Barrillot, a whistleblower investigating the impact of the Polynesian nuclear testing who died last year, raised awareness on the disproportionate rates of thyroid cancer and leukemia to hit Polynesia’s 280,000 residents. In 2016, then-President Francois Hollande acknowledged during a visit that nuclear weapons tests carried out in French territories in the South Pacific did have consequences for the environment and residents’ health. But Hollande spoke also about the testing in positive terms as he praised the region’s contribution to France’s position as one of the world’s nine nuclear powers. The presidential visit came three years after French media reported declassified defence ministry papers exposing South Pacific nuclear tests from the 1960s and 1970s as being far more toxic than previously acknowledged. At the time, the media reported that the whole of French Polynesia had been hit by levels of plutonium in the aftermath of the testing. Tahiti, its most populous island that was romanticized in the paintings of Paul Gauguin, was exposed to 500 times the maximum accepted levels of radiation. The fallout extended as far as the popular tourist island of Bora Bora. https://www.radionz.co.nz/international/pacific-news/376007/france-gives-tahiti-site-for-nuclear-memorial 15 November 2018 The French National Assembly has voted to give French Polynesia a building in Papeete for a memorial site of the French nuclear weapons tests. The decision means that the site of the former command complex of the French Navy in Papeete will be made available for this new centre. The public accounts minister Gerald Darmanin said this reflected a wish by the French Polynesian people to remember the tests. France carried out 193 tests between 1966 and 1996. The site is being given at no cost to French Polynesia provided it will build a memorial within five years. Otherwise the site will revert to French ownership. French group to visit French Polynesia nuclear sites https://www.radionz.co.nz/international/pacific-news/367417/french-group-to-visit-french-polynesia-nuclear-sites 27 September 2018 A French government commission is about to visit French Polynesia’s nuclear weapons test sites to help modify the French compensation law. The 12-member commission includes three of French Polynesia’s parliamentarians in Paris as well as representatives of ministries such as defence, health and justice. The group is due to visit Moruroa, Rikitea and Tureia over the next week to hear testimony of how the weapons tests, which were carried out from 1966, affected people on the atolls. The commission’s head Lana Tetuanui has told local media their visit may be seen as late but as the heirs of the bomb, they will do their part. During the week-long visit, the group will meet local representatives as well as test veterans groups. The commission is expected to report to the French prime minister Edouard Philippe before the end of the year. The compensation law, known as the loi Morin, is widely seen as too restrictive as most compensation applications have been thrown out. Tuilaepa Sailele berates leaders who fail to take issue seriously, singling out Australia, India, China and the US, Guardian, Kate Lyons, 31 Aug 18 The prime minister of Samoa has called climate change an “existential threat … for all our Pacific family” and said that any world leader who denied climate change’s existence should be taken to a mental hospital. By Pacific affairs reporter Stephen Dziedzic Samoan Prime Minister Tuilaepa Sailele has lashed out at climate sceptics and urged Australia to make deeper cuts to carbon emissions to help save Pacific Island nations from the “disaster” of climate change. Several other leaders — including Fiji’s Prime Minster Frank Bainimarama and the Marshall Island’s President Hilda Heine — have also called on Australia to do more to cut emissions. Philippines concerned over possible nuclear weapons in South China Sea, PhilStar, Patricia Lourdes Viray (philstar.com) – August 23, 2018 , MANILA, Philippines — Malacañang expressed concern over the warning of the United States that China might bring nuclear elements to its outposts in the South China Sea. The US Department of Defense, in its annual report to the US Congress, warned that Beijing may soon install floating nuclear power stations on its military bases in the disputed waterway. Presidential spokesperson Harry Roque said the Philippine government is concerned over any entry of nuclear weapons on Philippine territory. “We are concerned about the possibility that any foreign power be it American, Russian, Chinese may bring nuclear warheads into our territory and into Asean, which is declared as a nuclear-free zone,” Roque said in a press briefing Thursday. The Malacañang spokesman also noted that the whole Association of Southeast Asian Nations is a nuclear-free zone under the Treaty on the Southeast Asia Nuclear Weapon-Free Zone, which was signed. Roque, however, said that the warning was only “US observation” and that the Philippines is in no position to verify such report. Stuff, LAURA WALTERS , June 28 2018, When the United States dropped the atomic bomb on Hiroshima in 1945, Taeko Yoshioka Braid watched from the second-floor window of herclassroom, 60 kilometres away. Braid, who moved to New Zealand in 1956 and now lives in Hastings, travelled to Hiroshima the next day with classmates to look for her family members and take supplies to the victims. Yoshioka Braid said it was hard to talk about the horrors she saw as a 13-year-old in Hiroshima, including children separated from their parents, and people dying from burns from the blast and the radiated water. On her second trip to the town at the epicentre, she felt something sticking to her shoes. She eventually realised it was human skin, which had melted off, following the blast. …….. At a time when the international rules-based order is being challenged, and nuclear weapons remain a global issue, Prime Minister Jacinda Ardern has reinstated the Cabinet portfolio of disarmament and arms control. Ardern announced Winston Peters would take up the ministerial role, during her first foreign policy speech in February. In September last year, New Zealand was one of the first countries to sign the Treaty on the Prohibition of Nuclear Weapons at a ceremony during the United Nations General Assembly. The treaty is a landmark legally-binding international instrument prohibiting the use of nuclear weapons and related activities. In July last year, it was adopted by the United Nations Conference to Negotiate a Legally Binding Instrument to Prohibit Nuclear Weapons, Leading Towards their Total Elimination. Yoshioka Braid’s comments came during the international treaty examination, at a Foreign Affairs, Defence and Trade Select Committee hearing on Thursday. Something that needed to take place before New Zealand ratified the treaty. Alternative NZ submission by stuffnewsroom on Scribd…. (included on original) .. It was difficult to describe the experience, she said, adding that the bomb was so strong, some people died instantly, others were alive but too injured to move or talk. Her daughter, Jacky Yoshioka Braid said New Zealand needed to take a leadership role in the elimination of nuclear weapons. “We need to stop the fighting, and stop this fantasy around a nuclear war that we possibly could survive – it won’t happen. New Zealand created a world-leading anti-nuclear policy in 1984, after seeing what happened in Hiroshima, Nagasaki and the cold war years. Hiroshima witness urges NZ to lead nuclear weapons elimination, Stuff, LAURA WALTERS , June 28 2018 “………Last month, former Green party candidate, and disarmament campaigner, Thomas Nash said “for technology that hasn’t been used in conflict since 1945, nuclear weapons sure have a knack of getting on to the global agenda”. But it wasn’t surprising given they posed the greatest existential threat to humanity next to climate change, he said. Nash also spoke to the select committee on Thursday, urging New Zealand to take a leadership role in eliminating nuclear weapons and global disarmament, in general. “This treaty has a humanitarian purpose, this is rather distinct from previous international deliberations on nuclear weapons, which have tended to be about big power politics between countries weighing up the grand game and the balance,” he said. Nash painted a picture of “Cambridge grads, strutting around in operations rooms, thinking about deterrents and game theory, missile silos and sleek nuclear submarines”. “I think it’s important to think about bringing back this human element of the impact of nuclear weapons, because violence, militarism, relies on a dehumanisation of violence; abstracting it away from us. On behalf of New Zealand Alternative, Nash recommended New Zealand ratify the treaty next month, adding that early ratification would signal New Zealand’s commitment to eliminating nuclear weapons and to making genuine progress on international disarmament work. Nash was part of the International Campaign to Abolish Nuclear Weapons, which was awarded a Nobel Peace Prize last year after the group of Geneva-based activists was recognised for its role in pushing for a United Nations treaty declaring the weapons illegal. The Treaty on the Prohibition of Nuclear Weapons is a landmark legally-binding international instrument prohibiting the use of nuclear weapons and related activities. In September last year, New Zealand was one of the first countries to sign the treaty, at a ceremony during the United Nations General Assembly. At the time, then-foreign minister Gerry Brownlee said it represented an important step towards a nuclear-free world, despite no countries that currently hold nuclear weapons signing the treaty. New Zealand’s signing of the treaty was consistent with the country’s long-standing commitment to international nuclear disarmament efforts. “It establishes the first global prohibition on nuclear weapons and provides the international legal framework for a world without these weapons,” Brownlee said at the time. New Zealand joined over 120 other states in supporting the adoption of the treaty at a United Nations conference in July last year.